The Flaxseed wrap is a terrific functional food for making wraps, pita crisps, or even pizza crusts. Just add an egg and water and you are all set to go! These can be made in the microwave or in a skillet or oven. 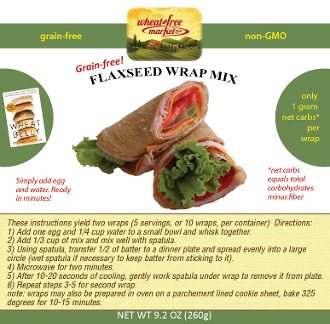 The flaxseed wrap is also nut-free! The instructions provided will make two wraps, so you'll get 10 wraps out of each bag. When making wraps, fold them on their side to cool after heating. This helps them stay flexible. For a pizza crust, make the wrap as desired and let it cool completeley before adding your sauce and goodies. This helps prevent the crust from becoming soggy. Then bake it for about 15 minutes or until cheese bubbles in a conventional oven. For Pita Crisps, double the cooking time so that the wrap becomes crisp. Cut with a pizza cutter and let cool. Enjoy with hummus or your favorite spread. Get creative and add other seasonings or diced vegetables to the dough. Maybe even a dash of hot sauce! Organic golden flaxseed meal, psyllium husk powder, onion powder, pink himalayan salt, cream of tartar, baking soda, white pepper, paprika.